Zugzwang is a situation that takes place when a player that has his turn to move is forced to make that move even if it will cause him a disadvantage. There are times when you can play in such a manner that you can bring your opponent in a zugzwang situation. What would happen if we were to add to the example from the previous article those pawns in the right? 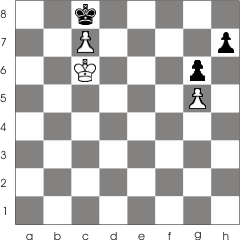 The absolute beginner could say that the position is equal because both sides have an equal number of pawns. That is far from truth. Notes that Black isn't able to move his pawn from h7 because the white pawn from g5 will immediately capture it (either by en passant if 1... h7-h5 or just a regular capture if 1... h7-h6). In fact White will win regardless of who moves first. If Black were to move first then he would loose the opposition and we would have the same situation from opposition. 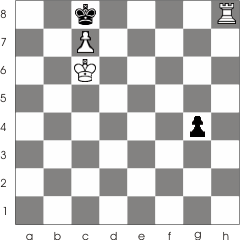 If White will make the first move then he will bring Black in a zugzwang position. Zugzwang 1. Kc5-d5 Kc7-d7 2. c4-c5 Kd7-c7 3. c5-c6 Kc7-c8 4. Kd5-d6 Kc8-d8 5. c6-c7+ Kd8-c8 6. 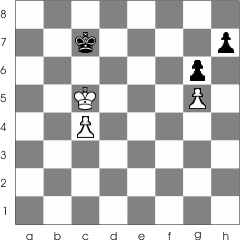 Kd6-c6 And voila the Black is official in a zugzwang position. If it wasn't the pawn at h7 then this would have been stalemate.But, that is not the case. White has intentionally lead the game to a zugzwang position for Back. Now Black is forced to move its free pawn. 6... h7-h6 7. g5:h6 ( Or 6... h7-h5 7.g5:h6(by enpassant) ) 7... g6-g5 8. h6-h7 g5-g4 9. h7-h8 The pawn is promoted into a rook and it's checkmate for the black king ; White wins.